The UCA Occupational Therapy students, Kyle Jones, Erin Spence, Lindsay Hobson, April Davis, and Mallory Halverson, helped lead the UCA Challenge summer program as a part of the Populations & Community Programming course. Dr. Tina Mankey was the project’s faculty advisor, and has led the OT department’s involvement for over 8 years. UCA Challenge is a week-long STEM day camp for 4-6th graders. Participants rotate through themed curricula in the Occupational Therapy, Chemistry, and Engineering departments. 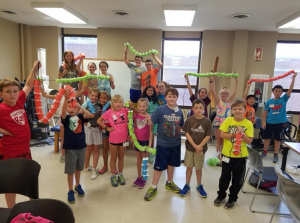 This year the OT department’s curriculum was “R U Brainy.” The OT students designed and implemented daily lessons and activities to help the campers explore the brain and nervous system in fun and hands on ways. From dissecting Jell-o brains, to relay-racing sensory messages up the spinal cord, participants truly saw their lessons come to life. Participants also learned real world applications of neuroscience, practicing brain protection in an egg drop activity, and role playing disabilities through activities that limited their senses and motor function. The week concluded with a spirited game of Jeopardy to review all they learned. Congratulations to our OT faculty, Drs. Elizabeth LeQuieu, LaVona Traywick, and Tracey Zeiner, who were recognized for their achievement in teaching excellence! The UCA Center for Teaching Excellence offers various tracks for professional development and these faculty worked hard for this achievement and to ensure the best learning for our students! Congratulations! First year students hosted a “Sensory Day” on campus this week! UCA students were able to take a quick sensory break and participate in a variety of hands-on activities incorporating their tactile, vestibular, proprioceptive, oral motor, olfactory, and other senses! This experience was a great way for OT students to apply and educate others about the principles of the Sensory Integration frame of reference they have been learning in the theory course. The c/o 2020 experienced Sensory Integration in action today at Pediatrics Plus in Conway! As part of the theory course, this experience allowed students an opportunity to connect material learned in the classroom to the real-world setting. A big thanks to Jamie and Andrea, the wonderful team of OT’s, and Pediatrics Plus for their continued dedication to our students’ education!! The Conditions class has had the opportunity to hear from a number of great guest speakers! Recently, Kelley & Anni from Conway Regional Wellness & Diabetes Education educated students about diabetes and how to test their blood sugar levels. Thanks to Conway Regional for being a wonderful community partner! Dr. Bernard Gojer from Arkansas Cardiology at Baptist Health, posing for a photo with the c/o 2020 (and Nibs)! The 2018 and 2020 students held a joint presentation of their “Whatchamacallits and Thingamabobs” and Research Posters this week. The 2018 students harnessed their natural innovator skills to design a “watchamacallit” (piece of adaptive equipment) that can be used in occupational therapy treatment for a client’s needs. In addition, the 2020 students presented their research posters to the class of 2018 and faculty. Great job to our future innovators and consumers of research! Occupational therapy students, Hayley Overbay and Kristen Steinsiek both participated in the Specialty Practice in Brain Injury continuing education course this semester, and on Dec 9, 2017, passed the Certified Brain Injury Specialist exam! They are now officially Provisional Certified Brain Injury Specialists! Big congratulations to them! OT students from the c/o 2020 advocated for OT at the Public Health Committee Meeting at the state Capital this week as part of their Professional Foundations course. Students were joined by the Arkansas Occupational Therapy Association lobbyist, Melissa Moody. The group met with various legislators and discussed OT as they arrived to the meeting. UCA OT students were also recognized at the beginning of the committee meeting. In addition, the students wrote a letter describing the distinct value of occupational therapy that was placed at each member’s desk. This experience provided students the opportunity to learn about advocacy of the profession in the legislative arena! Great job UCA OT! UCA Nursing and Occupational Therapy Research Poster Presentations – Dec. 1st. Great job to all students who presented their scholarly endeavors! Shout out to our talented service-learning students for their creativity and to our community partners for cultivating such rich learning opportunities! The self-proclaimed “BrOTs” from the c/o 2020 advocating for diversity in the occupational therapy profession! This group of OT students had a successful day informing others of OT’s role in mental health in the UCA Student Center. The group dispersed handouts on stress relief for students, including campus resources and homemade stress balls for people to make! Of course, OT facility dog Nibs, was the star of the show! Overall, the group estimated advocating to about 45 people. Great job raising awareness of OT and of the different avenues for stress relief on the campus of UCA! First year OT students represented the UCA Dept. of OT at the Central Baptist College Graduate Fair. Interested participants could test their OT knowledge with a spinning wheel game and receive general information about OT as well as the UCA OT program! Great job, students raising awareness of OT and representing UCA! If you or someone you know are interested in OT, call or email our Department – we would love to chat with you!! The Art & Science class completed their pillow-sewing projects today! This activity helps reinforce how the OT profession is rooted in the Arts & Craft Movement and how crafts can be used as therapeutic media. Nice job, everyone! Wesley United Methodist Church’s Trunk-or-Treat on Halloween. They decorated two trunks, provided games for children and families, had candy (of course), and provided information on how to make Halloween accessible for all children. In addition, students displayed a poster with basic information about OT and OT’s role with children. This group had great conversations about OT and looked great in their costumes! Way To Go! On Halloween it’s great to remember the annual Halloween Dance the OT Department hosts for Independent Living Services in Conway. On October 10th the first year OTD students did a great job making this a fun event for everyone! UCA Students, Samantha Lambert and Chelsae McCall participated in the October 17th – Center for Teaching Excellence (CTE) Lunch and Learn Event related to Service-Learning. Dr. LaVona Traywick and Lorrie George-Paschal participated in the event as service-learning faculty representatives. Our occupational therapy students engaged actively in round-table discussions with representatives of UCA community partners and UCA faculty! Discussions were facilitated through topic statements on the tables — highlighting the benefits and challenges of service-learning for students, partners, and faculty. The debrief, led by Lesley Graybeal, highlighted student learning and faculty’s perceptions of the benefits of this teaching and learning pedagogy! Way to go OT service-learning students! So many smiles in these photos. We are grateful for our continued partnership with Brookdale Chenal Heights and the opportunities they provide for our OT students! This week in the Pediatric Interventions course, students took a hands-on approach to learning about sensory integration intervention strategies by designing and implementing a variety of sensory activities with a nursery rhyme theme for children at Pediatrics Plus in Conway! On campus, students got to experience common sensory approaches for themselves! It was an exciting learning experience for all! The students were mentored by Dr. Tina Mankey, Mrs. Brittany Saviers, and Mr. Justin Brazeal. Many thanks to the staff and children at Pediatrics Plus for having us! Last week the Pediatric Interventions class participated, led,& analyzed social & behavioral intervention activities. Facility dog, Nibs taught about use of animal assisted therapy in this area! Lots of learning & laughter with hats, obstacle courses, & painting! Fun times in the Professional Foundations class over the past week! Students learned the history of OT by capturing the societal and healthcare events of a decade and presenting the influence on the OT profession while paying special attention to the tenets of OT and the profession’s occupation-base. This group brought all the founding fathers & mothers to play a historical game of Jeopardy! This group chose a History of OT Documentary! Nothing says OT history in the 1920’s-1940’s like a Snow White and the 6 Dwarfs skit! This group did a USO Video! 1960-1979’s created an Anchorman inspired version of OT History! A spin-off of the Friends sitcom represents OT History in the 1980’s-1999. Class of 2020: Learning the value of self-reflection by making creative and individualized name tags! OT Class of 2018 Present Research Results! More from the ARC Arkansas Performing Arts Camp! How many people can you fit into a closet!? Arc Arkansas, in partnership with UCA OT Department, presented the “Book of Wonders” Friday, July 28th!! The performance was held in Arkansas Hall on Henderson State University campus. It did not disappoint. It started with a thread of an idea and was knit into a fabulous show including dance, drama, video, set design, and costuming!!! The performers came from Arkansas, Texas, and California!! OT Department utilizes the Nabholz Center for Healthcare Simulation! On July 5, occupational therapy students in the Formative Competency course took advantage of the Nabholz Center for Healthcare Simulation by running two client simulations in preparation for the final competency exams. Students were able to get hands-on experience while applying their knowledge and skills in interviewing, assessing, making clinical observations, therapeutic use of self, debriefing, and much more with simulations related to Human Development and Psyschological Disorders. The students and the Department of OT would like to thank our clients who spent the day with us teaching – Ian Rowe and Mrs. Leslie Sims! Also, a big thanks to Jacob Baker (simulation center manager) for his hard work in getting us set-up! Students re-enacted stories of brain injury from Michael Paul Mason’s book “Head Cases” in their Applied Neuroscience class. The students did a great job of bringing the stories to life! They gained great insights about the common themes of change for the person, their families, the need for insurance, intervention for longer than the initial 4 week period after the injury, acceptances and of course, adaptation! They all did a great job!! The Conditions class learned about Lymphedema this week from Certified Lymphedema Therapist, James Saviers, MOT, CLT-LANA and his UCA OT 3 month fieldwork student, Matthew Lacy. We enjoyed the hands-on activities and thank you for sharing your knowledge and for your continued collaboration. OT students got Sensory Savvy hosting a “Sensory Day” on campus this week! UCA students were able to take a quick sensory break and participate in a variety of hands-on activities that incorporated their tactile, vestibular, proprioceptive, oral motor, olfactory, and other senses! This experience was a great way for OT students to apply and educate others about the principles of the Sensory Integration frame of reference they have been learning about in their theory course. A sea of purple flooded the sensory gyms at Pediatrics Plus (Conway location) today as students connected the classroom to the clinic as a way to experience Sensory Integration in action for part of the Theory course. A big thanks to Jamie Bailey, the team of OT’s, and Pediatrics Plus for making this experience possible and for their continued dedication to our students’ learning! Students get creative with course assignment! Students got creative when making a 3D model to connect information learned from their assessment and theory courses. Great job! Applied Neuroscience students enjoyed learning in the new Nabholz Center for Healthcare Simulation this week! Dr. Traywick successfully completed UCA Center for Teaching Excellence Recognition Track! She will be recognized during the Faculty Recognition Reception on April 20, 2017. Congratulations LaVona! Students in problem-based learning shared information with their classmates today on the topics of cerebral palsy, oppositional defiant disorder, and autism. It’s a great day for teaching your peers! The Conditions Influencing Occupational Performance class learned how low vision can impact occupational engagement and performance today with the help of Dr. George-Paschal and a valued guest – her mother! Students also received hands-on experience with assistive technology for low vision. Arc Arts Summer Camp was a one-week unique camp experience for adults with intellectual disabilities hosted by Arc Arkansas out of Little Rock. Hosted at Henderson State University this year, individuals spent the week preparing for a final performance which included daily classes of drama or dance. Our program was implemented as part of the camp experience to provide opportunities for individuals to participate in group activities as a way to increase their social engagement and participation. During this week occupational therapy students planned, developed, and implemented evening activities such as charades, various ‘get to know you’ games, bingo, card and board games to promote positive social interaction skills in a group setting. As part of our program development, we designed a portfolio that will be provided to the Arc in Little Rock which includes specific social engagement activities for continuation of our program goal. Our “Keep It Going” program utilizes secondary prevention to target the elderly population at Greenbrier Nursing and Rehabilitation Center (GNRC). The direct recipients include the participants at GNRC that take part in our 6 week program. These individuals will benefit from therapeutic exercises and activities that promote engagement in meaningful occupation to increase manual muscle strength, endurance, sensory integration, socialization, and cognitive function. Come Grow With Us worked with residents at Conway Human Development Center (CHDC) to encourage social interaction and creativity through the use of participation in a therapeutic gardening activity. Residents were encouraged to decorate and pot their own plants, water them, and sell them at a CHDC event. The Safe at Home project was developed to educate the community, specifically the elderly population on maintaining/creating a safe living environment, educating on home modifications and fall prevention, and encourage self-advocacy. An educational booth was set up at a local hardware store in Greenbrier, AR with pamphlets, checklists, fact and tip sheets, as well as materials for home modifications that could be purchased from the location. The group was available for demonstration and questioning on location. laptop ownership from 12% to 29% over that same time period. Media is everywhere in our lives and takes on many different forms. However, we often don’t think about the impact it may be having on us. So what is media? How does it affect me and the choices I make? Does it influence my daily occupations like eating and physical activity? These are some of the questions Media Monsters will seek to answer through experiential activities including making your own commercial. A summer day program for children with and without disabilities, the camp works to promote participation and encourage growth among children in the Conway area. At Camp Compassion Occupational Therapy students worked with children by implementing activities to increase social participation and independence with self-care skills. Students worked with residents at Conway Human Development Center to host a photography show where the residents shared their work and described the importance to them. Cody Stoops, Emily Nehus, Rebecca Gottsponer, Alex Lee, and Lydia Cody, graduate occupational therapy students, along with Tina A. Mankey, Ed.D., OTR/L, an associate professor, recently participated in a week long summer camp, UCA Challenge. The camp was sponsored by the College of Education and over 50 elementary students participated. Mr. Stoops and other students led hands-on lessons for the session, Media Monsters. In Media Monsters, the students discovered the importance of understanding media and how it affects our lifestyle choices. The students were exposed to how media can influence healthy choices and the importance of making healthy choices on one’s health. During the week, the students planned and produced their own creative commercials on healthy choices and/or physical activity. To conclude, the students had a viewing party, along with homemade popcorn and drinks. On March 29th, UCA Occupational Therapy Department hosted an Assistive Technology (AT) Lab experience for 20 Occupational Therapy Assistant Students from Arkansas Tech University, Ozark Campus! Dr. Paschal coordinated the event and six Occupational Therapy student volunteers helped by sharing technology with OTA students. Equipment stations included technology for Low Vision, Hearing, Communication, Computer Access, and Environmental Activities of Daily Living. Equipment demonstrated was provided by a grant from Increasing Capabilities Access Network (ICAN). It was a great experience and we loved having these future professionals come to UCA!! Adapting Toys and Talking Books! Holly Schroeder and her mom Alicia visited UCA’s Occupational Therapy House, December 3rd to learn how to adapt toys and learn how to develop and use talking books! Holly had many toys that she could not access due to cerebral palsy. So with student volunteers Kerrie, Taylor and Emily, we adapted a toy and engaged her mom in the process. Within six hours, her mom had emailed Dr. Paschal letting her know that she had already adapted another toy by herself and had borrowed a trackball for accessing the PPT! The exhibit entitled “Show of Hands” marks the first semester of occupational therapy school for UCA occupational therapy students. Like the experience of hand casting, the journey toward becoming an occupational therapist is marked by periods of intense activity, excitement, frustration, pleasure, and contemplation. Typical for endeavors associated with the field of occupational therapy, the process and outcome of hand casting reflects a complex blend of science and artistry. There is no denying the psychosocial aspect of creating an image of oneself. The occupational therapy students have taken the complex process of alginate and hydrostone casting to another level through their display of expressive hand gestures and the inclusion of objects that represent who they were, are now, and someday hope to be. Please join us on Tuesday, October 27, 2015, in front of the Student Center during x-period (1:40-2:30), and during Homecoming weekend, October 31, 2015, all day in the lobby of Doyne Health Science Center for our 3rd annual “Show of Hands” from the UCA Occupational Therapy Department. We hope you enjoy the show! For a sneak peek, click here! Special thanks to the Texas Woman’s University, OT Dept in Dallas for the creation and sharing of the idea of a show of hands! Occupational Therapy Student helps and learns from a hero! The students were in action by creating sensory games to help the children learn emotions and feelings at Pediatrics Plus! The students planned a variety of games and activities for the children to have fun with emotions. It was an exciting learning experience for all! The students were mentored by Dr. Tina Mankey and Mrs. Brittany Saviers.